An interview with PEXA as to how Kylie Dillon has completely embraced digital transformation. See the article below as to how and why the KDD App was developed by settlement agent Kylie Dillon…. 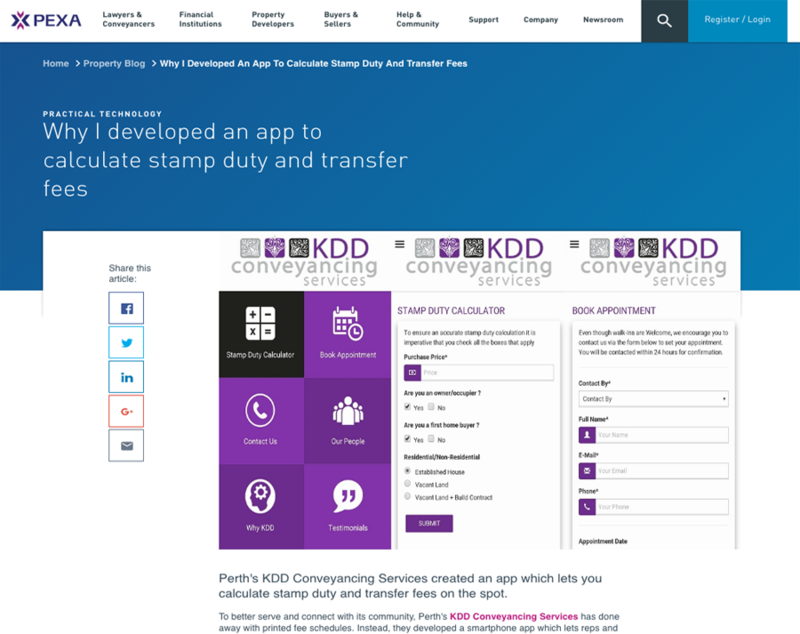 Perth’s KDD Conveyancing Services created an app which lets you calculate stamp duty and transfer fees on the spot. To better serve and connect with its community, Perth’s KDD Conveyancing Services has done away with printed fee schedules. Instead, they developed a smartphone app which lets reps and brokers calculate stamp duty and Landgate transfer registration fees on the spot. With stamp duty looming large in the minds of potential buyers, the KDD mobile app allows people to make decisions with confidence, says KDD Conveyancing Services director Kylie Dillon. “Up until recently, we’ve been very much a paper-orientated profession,” Dillon says. Rather than simply designing high-tech window dressing to win over the iGeneration, Dillon was determined to build a practical and functional app to better serve clients and offer a point of difference in the market. Reps and brokers previously carried cumbersome A4 copies of the fee schedule, printed on thick sheets of A4 cardboard. The new app puts everything they need at their fingertips. “Calculating stamp duty is the big appeal. That’s what most real estate agents and brokers want to be able to access straight away, because it’s a large amount of money that’s often vital in the negotiation stage,” Dillon says. As an added benefit, clients will often see their rep or broker using the KDD mobile app before they’ve chosen a conveyancer – so KDD Conveyancing Services becomes the obvious choice. Dillon spoke to various digital agencies before deciding to work with Perth’s Spinoff Digital. She found other app developers had no understanding of a settlement agent’s role, but most were still keen to sign the deal and cobble together something generic. Spinoff Digital’s founder, Phil Knight, was able to understand what Dillon wanted to achieve thanks to his background working with the Real Estate Institute of WA (REIWA) and as a real estate agent. “I wanted to find somebody who really understood our business so their insight would show through in the design of the app,” Dillon says. The team advised the app would be more effective if it was offered on various platforms, so they built it for Apple, Android and Windows devices. “They suggested adding an ‘our people’ tab since clients like to see who they are dealing with. Having an ’email me’ tab attached to the team member’s profile provided the client with an easy and efficient method of contact,” Dillon adds. The modular design of the app allows for extra functionality, such as letting clients use it to book appointments. Dillon is also considering other features, but is adamant that she won’t waste time building “an add-on for the sake of an add-on”. “It has to be good, relevant content. We’re having conversations with different companies about extra functionality, such as offering sellers and buyers additional products like title insurance, verification of identity facility and information regarding PEXA and electronic conveyancing,” Dillon says. download the Stamp Duty Calculator App from your app store here. contact KDD Conveyancing Service for your settlement agent requirements.